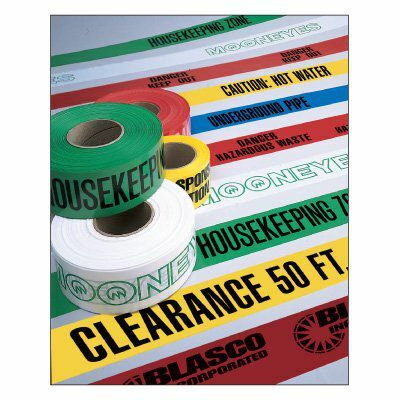 Choose the wording, size and thickness you need for your custom barricade tape. Use bold, eye-catching barricade tape to mark hazards or block off area and equipment. Your safety messages speak directly to workers. Choose from eight ink colors. Custom tapes are made of non-adhesive polyethylene for temporary use. Lightweight, economical 3-mil tape is versatile for indoor/outdoor use. 4-mil tape is resistant to harsh weather and chemicals - a more durable option for outdoor use and long-term indoor use. 6-mil tape resists ripping and stretching - the most durable choice for outdoor/indoor use and long-term applications. Available in 500' or 1000' rolls.